Challenges - Reliquiae and 100+ books. First paragraph: Silas Heap pulled his cloak tightly around him against the snow. It had been a long walk through the Forest, and he was chilled to the bone. But in his pockets he had the herbs that Galen, the Physik Woman, had given him for his new baby boy, Septimus, who had been born earlier that day. 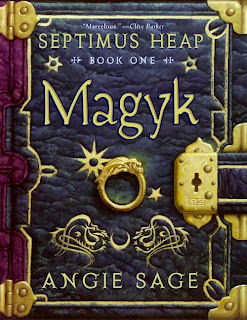 Magyk is the first book in a series all about Septimus Heap. Septimus Heap is the seventh son of the seventh son who also happens to be a wizard. Unfortunately Septimus is pronounced dead within minutes of being born and his body is whisked away. Silas, his father comes across another baby on his return journey from the woods and takes the baby home and Jenna is brought up as one of their own, helping to heal their loss of Septimus. Only Jenna, is not quite what she seems. Jenna is the daughter of the murdered Queen and lives hidden with the Heaps until she reaches the age of ten and the Consulate discover where she has been kept hidden. Jenna has been kept hidden to stop the Necromancer DomDaniel form finding her and killing her. Marcia, the ExtraOrdinary Wizard takes Jenna to live with Aunt Zelda in the marshes, whilst escaping they take a boy from the Young Army with them. Boy 412 as he is known turns out to be very useful and eventually helps in saving Jenna's life and returning her to the throne. This is another book where I had to really think about what I could tell you, as there are lots of interesting turns of events. I absolutely loved this book and even though it was over 500 pages I whipped through it, immersing myself in the wizarding world. It was a detailed read, where the descriptions flow so beautifully. I loved the characters in it, Boy 412 changes from a weak and frightened soldier to a fearless warrior. Jenna, is strong from the beginning, as if deep down she was already aware that she was destined to be Queen. The Boggart, all slimy and muddy and just absolutely adorable! The story sets off at a good pace from the beginning and you feel like you are following on a roller coaster. I found it as appealing as Harry Potter,yet set in a medieval period instead of the present day. It is not as good as Harry Potter, but if you loved Harry, then I think you will enjoy this book. The illustrations at the beginning of each chapter are beautiful too, if my camera had been charged I would have taken a picture to show you. Unfortunately, you will just have to take my word for it. There seem to be very mixed reviews on it, personally I absolutely loved it and I will definitely be reading the next in the series. I would also say I enjoyed it enough to read it again in the future. I have just discovered that there are now plans to make it into a live action movie with some animated characters. Yay! I've heard such good things about this, and it really sounds like my kind of book. Like Michelle, I was a bit intimidated by the size, but you did say you breezed through it! Oooh, this sounds like a book my whole family would enjoy! I love this series - I'd definitely see a movie version if they ever make it! I would definitely be drawn to this book by its cover...I love it! The story sounds very enjoyable as well. The cover is beautiful and the book sounds wonderful! Thanks for this great review! I've never heard of this one but it sounds fantastic. I need something to read with wizarding as I'm still going through Harry Potter withdrawal. I should see if my library has a copy of this. I just came home from there though and brought home a bagful of YA books. Who's going to read them all I'm still not sure. lol. Great cover on this one as well! I love the cover on this one! And it sounds great. I so want to read this series. My daughter really loves them! Glad to hear you found this so enjoyable, too! I've seen this around and had wanted to buy it long, long time ago but didn't. You totally changed my mind now, Viv! I'm so glad I read your review of this book, Vivienne. I pick up this book every time I see but have been unsure about buying it. Now, I will! I love all that wizardry and the story sounds fun. And how could you not love that cover! I must digg your article so other folks can see it, very helpful, I had a hard time finding the results searching on the web, thanks.